Starting today, I will refer to this movie as Fant4stic and never as the Fantastic Four film that was produced in 2015. No, it would be a too cruel enough fate for this film for it to be remembered as the Fantastic Four film that was actually worse than the previous two films that came before it. It’s been almost a week since I went to see Fant4stic and I’m still smarting from how awful it was. My review of the film reflects my pain. And I’m not alone. Critics have tore into this film like a pack of wolves that have trapped a fluffy white bunny… but, this time, the fluffy white bunny totally deserves it. As of this writing, Metacritic shows that the film currently has an average rating of 27. Rotten Tomatoes has it at a 9% “Rotten” score. 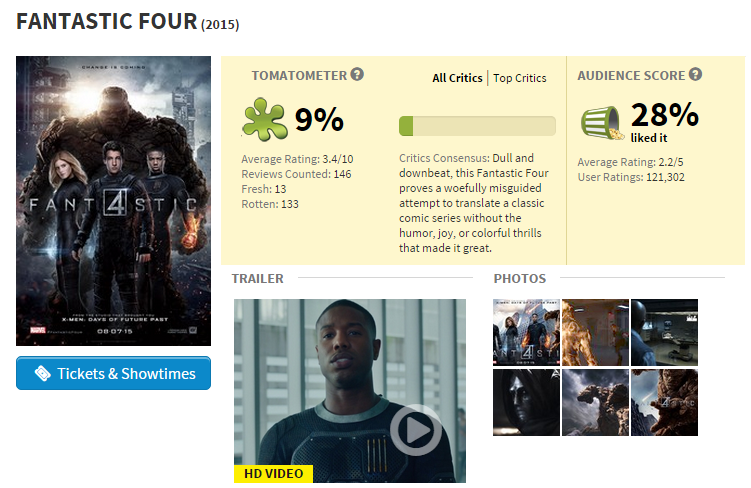 Is there a way I can request Rotten Tomatoes to call this Fant4stic as well? But where did the movie go wrong exactly? Well, it wasn’t just one thing that made Fant4stic an abomination. It was a myriad of reasons. But, if I did mention all of them, this would be one heck of a long post. Instead, to be ironic about it, I decided to mention the fantastic four reasons why this was a terrible, terrible movie. And, yes, there will be SPOILERS. This is almost as bad as the Deadpool we got in Wolverine: Origins. Doctor Doom is an iconic character in the Marvel Universe for good reason. 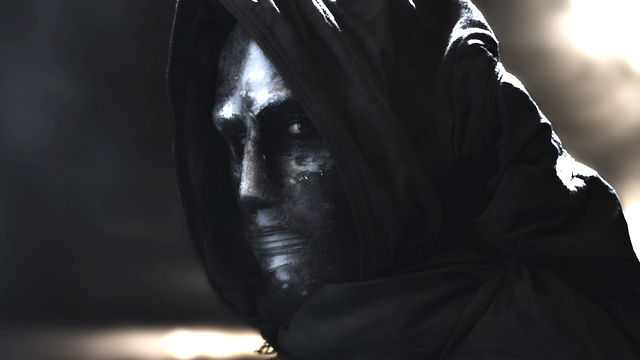 For one thing, Victor Von Doom is kind of an evil Iron Man. He has this armor than enables him to fly and can shoot laser beams out of his hands. But he’s far more interesting than the egotistical billionaire, Tony Stark. First, he’s the king/dictator of Latveria. Yes, you read that right: Doctor Doom is the ruler of his own freaking country! I mean, that’s awesome by itself! But we have the other things that make him an interesting character, such as his origins. During his college days, he created a machine enabling him to make contact with the dead. However, there was a flaw in the machine, which Reed Richards pointed out but Doom didn’t listen. The flaw caused an explosion, severely disfiguring his face (or just left a scar; it depends from writer to writer). He then travels to Tibet to train with monks (!) and, to hide the scars, creates the famed Doctor Doom armor. He then swears vengeance on Reed Richards because, well, he believes the future Mr. Fantastic caused the accident! And I’m just scratching the surface here! So, what did they do in Fant4stic? Make him an emo nihilist. Really. That’s what they did. After being trapped in an alternate dimension (probably The Negative Zone) for a year, thanks to Reed Richards (this time, it actually is Reed Richards fault! ), he is “rescued” and then uses his… death stare powers (they don’t really bother explaining how he’s killing everyone willy-nilly) to forcibly use the transporter… God! What did the do with you, Doom? This movie is roughly 100 minutes long! But it seems much longer. How much longer? It feels like it lasts for 8 years. And that’s how many years it takes to tell the entire story in Fant4stic. Here’s the movie’s entire story in a nutshell. The movie starts out with Reed Richards and Ben Grimm in middle school. Reed has actually invented a teleporter and demonstrates it to Ben. Fast forward 7 years, both Reed and Ben are best friends and they enter their improved teleporter in a science fair. This attracts the interest of Franklin Storm who invites Reed to join the Baxter Institute. Reed, along with the seriously antisocial Victor Von Doom, the super smart but only if she’s listening to music (really) Sue Storm and incredible welder (really) Johnny Storm build a better teleporter. In a drunken haze, Reed, Victor and Johnny decide to use the teleporter first. Reed brings in Ben and they don’y bother calling Sue because… she’s a girl? I dunno. Anyway, Victor gets trapped in the newly discovered planet/dimension and everyone (including Sue because… movies) gets powers. Reed escape Area 57 (really? Area 57?) and promises Ben he’ll find a cure. One year later… they find Reed, which totally makes his escaping pretty much a waste of a year. Reed finishes the teleporter and scientists discover Doom in the dimension thing. Doom is now insane and tries to destroy the Earth. Reed, Sue, Johnny and Ben team up despite the four never being in the same room until then to defeat Doom. The End. Why the hell did it take 8 years to tell a single origin story? It baffles me! Instead of giving us the incredibly awesome Human Torch, the 1978 Fantastic Four cartoon gave us HERBIE the robot… which reminds me a lot of the acting I saw in Fant4stic. Tried as I might, I couldn’t see any chemistry between the characters. What’s worse, they all acted pretty much like robots! The dialog was unrealistic, like something a machine would write. The acting was wooden and robotic, as if they were just going through a pre-programmed routine. When the actors tried to convey some emotion, it totally fails. When you consider the acting caliber of the cast here, it just makes it more painful to watch. By far the biggest problem Fant4stic has is that nothing really happens! Throughout the majority of its 8 year… sorry, 100-minute runtime, nothing interesting happens in Fant4stic. No action. No character development. No witty dialog. No comedy. No action. The sad thing is that there is a story aching and straining to get out! But I just didn’t care! I didn’t care for the characters. I didn’t care for the universe it was setting up. Heck, during the end of the film, where the Earth was being torn apart, a part of me actually wanted the planet to be destroyed because at least that would’ve been interesting! Ultimately, the four things I mentioned above are just four issues I have with the movie. I didn’t even go to how awful the special effects were or how drab everything looks. It makes me kind of worried that 20th Century Fox, the movie that produced Fant4stic, is also bankrolling the Deadpool movie! Don’t you dare mess up the Deadpool movie, 20th Century Fox! This is your chance to make it all right. What were some of your issues with Fant4stic? Let me know in the comments section below!